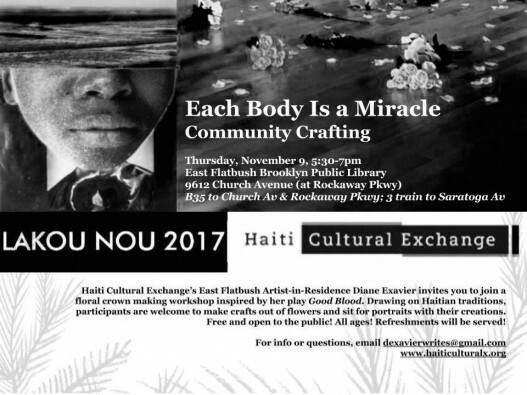 Diane Exavier, Lakou NOU 2017 artist resident in East Flatbush, describes her project Each Body is a Miracle, as “…a social praxis; a play in retreat; an exploration of health, wellness, and creativity in East Flatbush.” The project, inspired by her original play Good Blood, allowed her to delve deeper into the issues and themes of the play: immigration, partnership/intimacy, and health — via research, community crafting, and social practice. From the journey of Caribbean immigrants as part of the African Diaspora to the arrival of the global epidemic of AIDS in 1980s New York, Good Blood crosses language, time, and even the ocean in an attempt to question the contracts we make, the conditions we live under, and what it means to reach for a love that might outlive you. This fall, Each Body Is a Miracle offers the community of East Flatbush a chance to ask some of the same questions the play’s characters tackle: How do we live every single day? How does that help us take care of our bodies? What are the conditions we agree to in order to do that? She segmented her project into three parts: 1) field notes, where she asked, what health issues are most affecting the lives and bodies of Haitian community members in East Flatbush today? 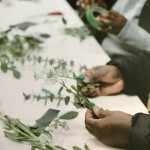 2) community crafting, where she facilitated a floral crown making workshop, related to the Haitian traditional practice of plasaj, and 3) reportage, an exercise in active dramaturgy, combining research and documentation with live performance. One small, quiet boy, with skin as dark as my father’s entered the room. He ate a few cookies before mumbling, “I want to make a flower.” I obliged his request by placing wire around his head, fitting him for a crown, not daring to pretend he would ever be a king. I showed him how to attach flower and he was set on his way. He quietly worked on his floral crown for about 45 minutes before he finished in silence and filled up his snack plate with more cheese puffs. I remarked how wonderful his crown looked and held up a compact mirror for him to look into. He stared at his reflection, so satisfied and happy with what he had created and how it was resting on his head. I asked him if he made it with a wish in mind. He nodded yes. 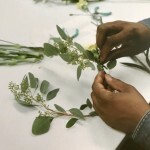 Lessons learned from part 2, were shared on December 9th, at Brooklyn Fete, during Diane’s staged presentation of Good Blood and during the second rendition of community crown crafting. Find photos by Richard Louissaint on Facebook here! This entry was posted on Wednesday, December 13th, 2017 at 10:21 am	and is filed under Archive, Lakou NOU, Literature. You can follow any responses to this entry through the RSS 2.0 feed. You can leave a response, or trackback from your own site.